In a week where several major new Hollywood movies were released in the US, we were quite fortunate that 2 of them were also released in Indonesia. The first one was Red Sparrow which played on Wednesday and the other one premiered yesterday. I convinced my wife to see this one as I knew this was a remake of a movie that was very famous in the 1970s and 1980s due to its heavy violence. We chose to see this movie at Kuningan City as we had to do some errand there. We shall go on with the movie now. A very successful surgeon named Paul Kersey (Bruce Willis - Die Hard series, The Sixth Sense etc) was having a wonderful life as ER doctor in Chicago hospital. He was having a perfect family where her wife Lucy (Elisabeth Shue - Leaving Las Vegas, Hollow Man etc) was also studying to be a doctor and their only daughter Jordan (Camila Morrone) who just graduated high school and was going out of Chicago for her college education. Paul was also very close to his brother Frank (Vincent D'Onofrio - Full Metal Jacket, Daredevil TV series etc) who seemed to be unemployed. All things seemed to be going very well for Paul until one day his world collapsed when his wife and daughter became victims of a robbery in their own house. The incident left Paul with so much loss that he started to feel directionless. Especially since the police detective Raines (Dean Norries - Under the Dome TV series etc) and his partner Jackson (Kimberly Elise - The Manchurian Candidate etc) were going nowhere with the investigation to find the culprit. Until something happened that made Paul got the taste of taking matters in his own hand. He started to become a vigilante and look for the persons responsible for their crime against his family. So could Paul find all of the bad guys and get his vengeance? Or would the police capture him before he was able to do so? Find them all in this vigilante crime drama movie. I knew that this movie was a remake of a 1974 movie played by Charles Bronson. I honestly could not remember if I had seen that one, but I remember the main story of a man who had revenged the persons responsible for his family's suffering in a very brutal violent way. From what I felt when watching this, my first thought was the crime to Paul's family was violent but the transformation from a good rich doctor to become a sadistic vigilante felt a little bit unrealistic. Then when the news of his family's suffering was told to him, I thought that Bruce Willis did not seem sad enough. Personally I felt it would have been a lot better and resonate more to audience had the condition he was in were a lot worse and devastating to him personally. We could probably be a lot more understanding why he could become a sadistic vigilante. This is where I think the original movie was more logical. The things happening to Paul's family in that movie was a lot worse and would make us be more "receptive" of his actions (though morally unacceptable). My personal feel is that this movie tried to tone down a bit on the violence on Paul's family and put some more back story about whether vigilante's actions could be accepted. The pace of this movie felt a bit slow and only started to pick up in the middle. But I have to admit, the killing of the villains were truly brutal and would not disappoint fans of this kind of genre. Which is why the movie had an R rating in US and also categorized for 21 years above in Indonesia. 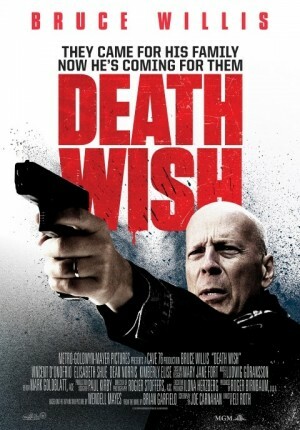 As an action star, I think Bruce Willis still got it. But lately he had been cast to play in various roles which did not really suit him. This was no exception. Apart from those killing scenes on the bad guys (which I am very sure most of the audience would be satisfied to see, just as my wife and I did) that he truly nailed, his representation of a doctor turned vigilante was not really convincing to my opinion. There were also scenes which probably served as reminders to US government not to give guns permit so easily. I think that Eli Roth (director of several horror films such as Cabin Fever, Hostel & its sequel and several others) took this film very seriously to convey his messages and make the film to be more relevant to the current situation. But I personally think that if he was able to make Bruce Willis showed more emotions and provided more of those vigilante actions, it would be more satisfying to me. Btw, the sound effects of this movie was awesome especially during the gun shooting scenes which really added the intensity. Now if you are looking for a vigilante action movie where the plot did not really matter or the dramatic part was not a determining factor (as long as the revenge scenes are there), then this could still satisfy you. And if you are able to stomach few of the brutal killings, then it should be a good option. But if you are not fan of such genre and you prefer to see a not so violent movie, then perhaps this would not be appropriate for you. The choice is yours. PS: This movie and the 1974 original were based on the novel of the same title written by Brian Garfield back in 1972.